Student leaders of Campus Kitchen, one of multiple groups on UK's campus providing food to UK students dealing with food insecurity. LEXINGTON, Ky. (Oct. 16, 2018) — College students face many of the same struggles with food and housing insecurity as others do in Kentucky, based on a recent sampling of University of Kentucky students. Ensuring student success and well-being by meeting basic needs is a challenge for colleges and communities across the nation, where it is estimated that one in six adults and one in five children do not know from where their next meal will come. Food insecurity, as defined by the U.S. Department of Agriculture, is the “limited or uncertain availability of nutritionally adequate and safe foods due to lack of financial resources.” Housing insecurity encompasses a broad set of challenges including an inability to pay rent or utilities or the need to move frequently. 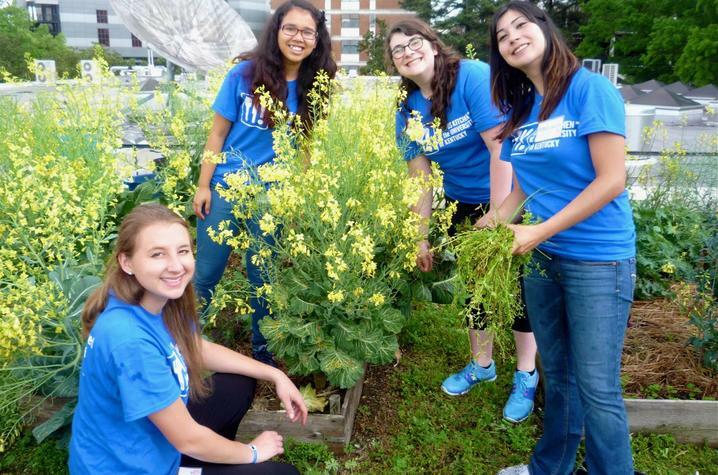 The University of Kentucky is committed to making food security a priority. The Food and Housing Security Workgroup, established by the Dean of Students, is working to coordinate the university’s activities. One of the latest examples of a multi-pronged effort to address food insecurity is a new program to provide free meals for eligible students at UK dining facilities for the duration of the fall semester. Dubbed Swipe Ahead, students can apply to be considered for free meal swipes while supplies last. Students interested in the program can apply online beginning Oct. 17. The application will close when all available swipes are distributed. Applicants will be notified of decisions within 48 hours of applying. Swipes refer to meals that can be used at Champions Kitchen or The 90 this fall. SSTOP Hunger: Sustainable Solutions to Overcome Poverty, UK Student Government and UK Dining are partnering in the Swipe Ahead program at UK. But such efforts, President Eli Capilouto and other UK officials believe, can’t be one-off initiatives. Rather, they must be part of a coordinated and strategic approach, based on research and best practices. For example, to determine the prevalence and implications of food and housing insecurity among students, the UK Department of Dietetics and Human Nutrition in the College of Agriculture, Food and Environment and Department of Writing, Rhetoric, and Digital Studies in the College of Arts and Sciences collaborated with students to administer a two-phase research study. The research was funded by a Student Opportunity Grant from the Food Connection at UK and an Inclusive Excellence Grant from the Office for Institutional Diversity. Of respondents to an anonymous UK student survey, 43 percent said they had experienced food insecurity, 19 percent had experienced hunger and 8 percent had experienced housing insecurity within the past year. The anonymous online survey was completed by 1,632 UK students. High rates of food and housing insecurity among college students can be attributed to several factors. For example, 68 percent of UK’s students come from within the state that ranks fourth in the nation for poverty: 18.5 percent of the state’s total population lives below the poverty line and 15 percent experience food insecurity. The Big Blue Pantry, an on-campus food pantry that is open to all UK students. The Campus Kitchen at the University of Kentucky, an on-campus student service organization that recovers food waste and serves healthy meals around the community including a free lunch to students from 11 a.m. to 1 p.m. every Wednesday, in 207 Funkhouser through the Farm-to-Fork program. UK LEADS (Leveraging Economic Affordability for Developing Success), a grant program that targets students with $5,000 or more in unmet financial need. A pilot program, over the last two years, has awarded nearly 300 UK LEADS grants to students. The university is awarding more of its institutional aid based on financial need. More than 85 percent of UK students receive financial aid through scholarships and grants that don’t have to be repaid. As a result, the out-of-pocket cost to attend the university for Kentucky students coming from families with a median household income of less than $20,000 annually actually declined last year. UK also has initiated a Student Financial Wellness Center, which offers a financial literacy programing, peer mentoring and other resources designed to help students address their evolving financial needs. UK has started the Wildcat Transitions initiative, a renewed focus on the first-year experience at UK. This program is designed to enhance belonging on campus, as well as awareness of resources such as the Student Financial Wellness Center, the Big Blue Pantry, etc. If you or someone you know is struggling with food or housing security, a list of on-campus resources and the full report are available on the Food Systems and Hunger Studies website. Hege; Tammy Stephenson, associate professor, Department of Dietetics and Human Nutrition; and Mike Pennell, associate professor, Department of Writing, Rhetoric, and Digital Studies, were lead researchers on the food access study. Student leaders were from SSTOP Hunger: Sustainable Solutions to Overcome Poverty, the Campus Kitchen at the University of Kentucky and Big Blue Pantry.